The story of the making of Ren and Stimpy is one of an irresistible force meeting an immovable object. The irresistible force was John Kricfalusi, a veteran animation artist who was disgusted with the quality of TV animation. He was determined to push the art and humour closer to the Warner Bros. cartoons he admired, though with a decidedly personal twist. The immovable object was the TV industry, specifically cable channel Nickelodeon. Like all channels, it was dedicated to budget restraint, regular air dates, and bland content that wouldn't provoke attacks. From the start, this relationship was a disaster in the making. The surprise, though, is that it produced a hit show. 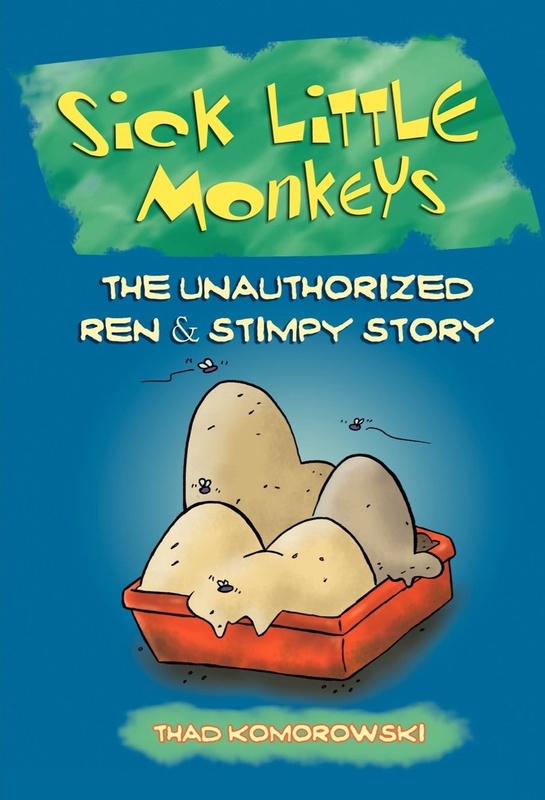 Thad Komorowski's book, Sick Little Monkeys: The Unauthorized Ren and Stimpy Story, exhaustively examines the behind-the-scenes goings on. He starts with John K's career in Saturday morning cartoon factories and details his relationship with Ralph Bakshi. Together they made The New Adventures of Mighty Mouse, a sort of precursor to Ren and Stimpy. Even before Ren and Stimpy, Kricfalusi was butting heads with broadcasters, as his experience on the short-lived Beany and Cecil revival shows. For those not familiar with the history of Ren and Stimpy, it was one of Nickelodon's first three original animated series and the one that attracted the most attention. There was no question that John K's sensibility was a success with audiences. However, right from the start, the show developed schedule problems due to a mismatch between what the artists wanted to make and what Nickelodeon was willing to air. John K. was another factor delaying production, as he wasn't willing to approve things until they met his standard. When the delays continued during the second season, Nickelodeon fired John K. and his studio. Nickelodon created its own in-house studio to continue production and Ren and Stimpy lasted for another three seasons without John K.
While that might have been the end of the story, John K. was reunited with his characters when another cable channel, Spike TV, revived the series for an adult audience. Unfortunately, Kricfalusi's insistence on meeting his vision at any cost doomed the revival. While the order was for just six episodes, only two made their air dates and the last delivered a year late. Spike lost interest in the show and didn't bother to play three of the episodes. John K. is a controversial figure who divides artists and fans into those who support him and those who think that he is responsible for his own misfortunes. Komorowski walks the middle ground, showing that all parties made mistakes and refused to consider the others' point of view, but he does not excuse Kricfalusi's behavior. Komorowski talked to many artists who worked on the show and quotes many Nickelodeon executives on the problems they faced getting episodes on air. While I don't doubt that people involved in the production could quibble with Komorowski's version of specific events, it strikes me that the book is even-handed in apportioning credit and blame. Fans of the show will enjoy comparing their opinion of each episode to the author's and learning of material that was cut and censored. If you are not a fan of the show, this book is still worth reading for the light it sheds on the workings of the TV animation business. There is always tension between artists and business people over resources and content. People working in TV animation and those with ambitions to create shows need to understand the pressures and the pitfalls that shape the business. Sick Little Monkeys: The Unauthorized Ren and Stimpy Story is a cautionary tale about walking the fine line between artistic ambition and the reality of the marketplace. After 37 days, my cast (the last of four) is off. There's a lot of work to do to regain flexibility and strength. However, life is a little closer to normal now. 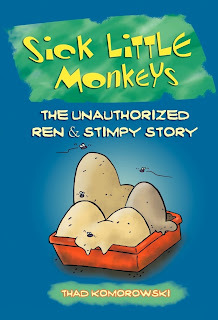 Coming soon: Reviews of Sick Little Monkeys: The Unauthorized Ren and Stimpy Story by Thad Komorowski and John Carter and the Gods of Hollywood by Michael D. Sellers.